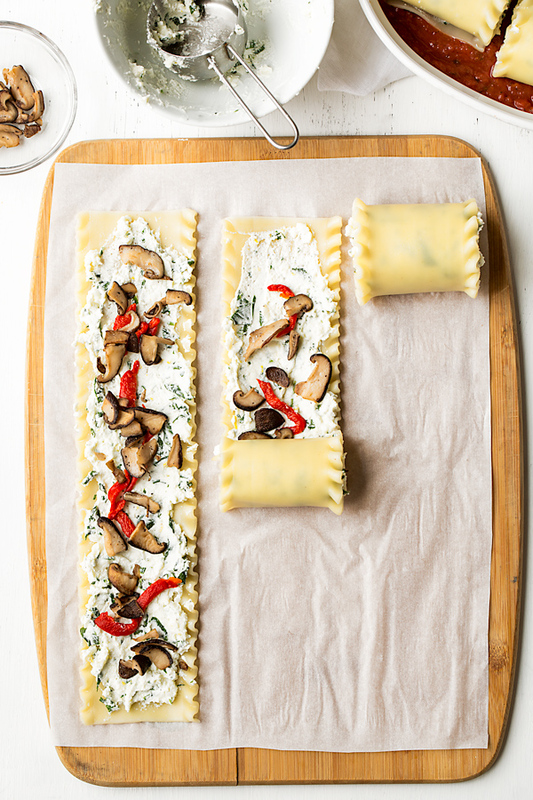 Rich and flavorful, these lasagna roll ups filled with mushrooms, roasted red peppers, and a savory mix of ricotta and spinach are a fun way to serve up traditional lasagna! 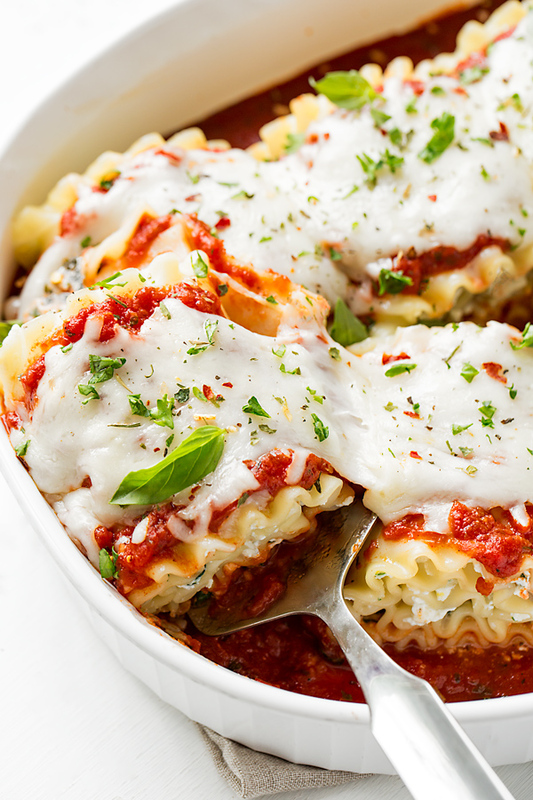 When it comes to a piping hot, baked pasta dish, lasagna is pretty tough to beat! 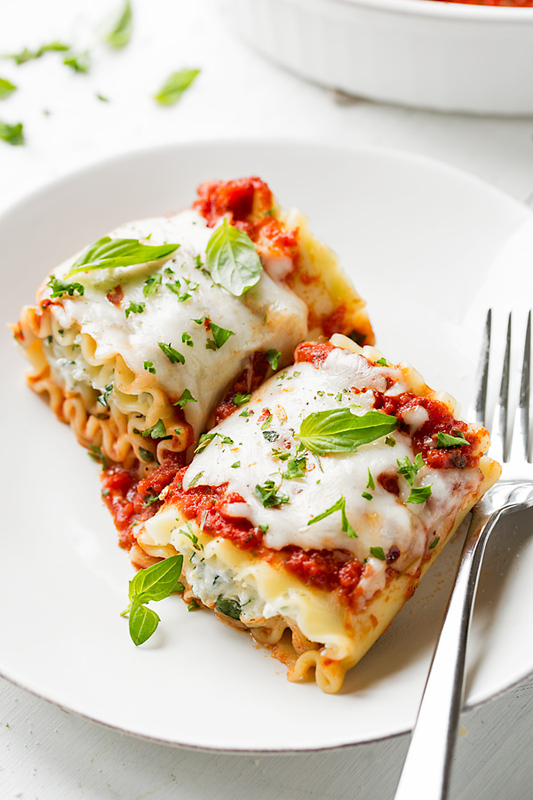 With its tender noodles, its rich layers of zesty sauce, savory filling, and ooey-gooey melted mozzarella, lasagna is a comfort food feast, and an absolutely scrumptious one at that. But a neat twist on traditional lasagna that is also quite delicious and fun are lasagna roll ups—cute little packages in pasta form! Lasagna roll ups are quite easy to prepare, and can be filled with all sorts of savory ingredients like ground beef, sausage, chicken, or even turkey; but for my lasagna roll ups recipe, I like to keep it more “veggie-friendly” and load these up with thinly sliced shiitake mushrooms, a sprinkle of sliced roasted red pepper, plus an herby ricotta and spinach filling. And I love to top them with a zesty homemade marinara sauce as well! 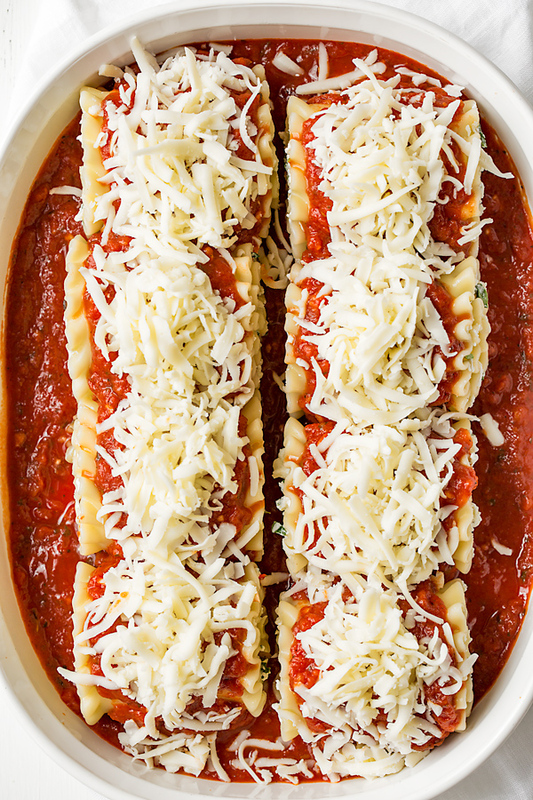 Cheesy and delicious lasagna roll ups are a fun alternative to layered lasagna, totally versatile and easy to prepare—the perfect little pasta packages, hot, fresh, and super cozy! Shiitake mushrooms are flavorful and meaty; and when sliced thinly and sauteed, are a scrumptious part of the vegetarian filling for these lasagna roll ups. And because roasted red peppers out of a jar are not only convenient but sweet and delicious (not to mention colorful! ), I simply drain, pat dry, and slice some up to add in. Fresh baby spinach leaves are chopped up and added directly into the creamy ricotta-mozzarella filling, which is mixed together with some fresh parsley, a hint of lemon zest, and some salt and pepper, adding some nice richness to the recipe. This fresh and vibrant filling is super savory and delicious, and is a great way to sprinkle in some extra veggies in a form that even picky eaters will enjoy! Cook your lasagna noodles until al dente, and allow them to slightly cool. Prepare your filling ingredients meanwhile, and allow the sauteed mushrooms to slightly cool. Next, add some of your sauce to the bottom of your baking dish to create a little “bed” for the roll ups. Then, spreading some of the cheese mixture over each noodle, along with a sprinkle of some of the mushrooms and peppers, proceed by carefully rolling the covered noodles upward to create the roll ups. Finally, place the lasagna roll ups seam-side down in the sauce, top with more sauce and a finishing sprinkle of cheese, then bake! Don’t overcook your lasagna noodles: To make sure that your lasagna roll ups will stay intact and hold their shape, cook the noodles just until al dente, about 9-12 minutes. This way, they’re pliable, yet won’t fall apart. Allow things to cool a little: Once your mushrooms are sauteed, allow those to cool slightly so that you’re not putting hot filling into the roll ups. Room temp is best! Keep things vegetarian, or add some meat: I love the flavor of the veggie combo in this recipe, but feel free to add in some cooked ground beef, turkey, sausage, or even shredded chicken. These saucy, savory, and cheesy lasagna roll ups are filled with shiitake mushrooms, roasted red peppers, and a creamy mixture of ricotta and spinach—they’re a tasty twist on classic lasagna! –Preheat the oven to 350°, and set aside a medium size baking/casserole dish. –Begin by preparing the sauce (if making): place a medium-size sauce pan over medium-high heat, and add the olive oil; once the oil is hot, add the garlic, the Italian seasoning, the black pepper, the oregano and the red pepper flakes, and saute them together for about 30 seconds to 1 minute, just until aromatic. –Add in the tomato paste and stir, cooking it for a moment or two to cook out the raw flavor; then add in the crushed tomatoes plus the salt and pepper, and gently stir to combine; gently simmer the sauce for about 10-15 minutes, uncovered; use immediately, or if prepping ahead, allow it to cool completely, and keep in the fridge until ready to use. –Meanwhile, for the lasagna roll ups: place a large, non-stick pan over medium-high heat, and add the olive oil; once the oil is hot, add in the sliced shiitake mushrooms along with a pinch of salt and black pepper, and saute them until golden-brown and their liquid has evaporated, about 8 minutes; turn the slices out onto a plate to hold and cool slightly. –Next, in a small bowl, fold together the ricotta cheese, 1 cup of the mozzarella, the chopped spinach, 2 tablespoons of the chopped parsley, lemon zest, 1/2 teaspoon of salt and 1/4 teaspoon of black pepper, and set aside for a moment. –To assemble, begin by adding about 1 cup of the sauce to the bottom of the baking/casserole dish; next, on a work surface, lay your cooked lasagna noodles in front of you vertically, and spread a slightly heaping 1/4 cup of the ricotta cheese mixture over each lasagna noodle. –Next, top that with a couple of shiitake slices, and tiny sprinkle of the roasted red pepper slices; roll the lasagna noodles upwards as evenly and as tightly as possible, then set them seam-side down in the sauce in the casserole dish. –Top the lasagna roll ups with more sauce, then sprinkle with the remaining 1 cup of shredded mozzarella, tent loosely with foil (not allowing it to touch the cheese as to not pull it off), and bake for about 15 minutes; remove the foil and continue baking for another 15 minutes, until the cheese is gooey and melted. –To finish, sprinkle the remaining chopped parsley over top, as well as the basil leaves if using, and serve immediately while hot. Interested in more lasagna recipes? Check out this Six-Cheese Lasagna, this Chicken Florentine Lasagna, and this Autumn Lasagna! 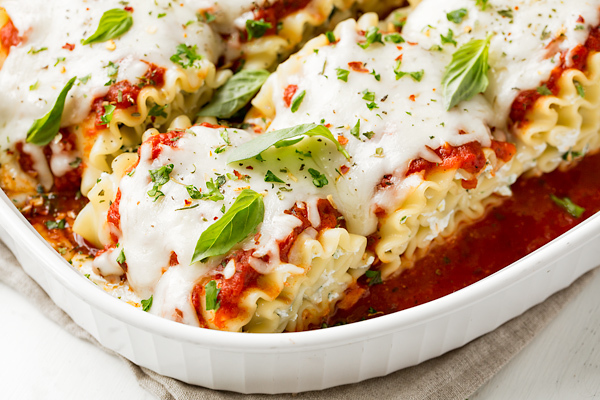 This lasagna looks AMAZING- outside AND in! Your lasagna looks so delicious! I love lasagna, can’t wait to give your recipe a try! This looks just delicious and I am always in need of a good tomato sauce recipe. You really need to stop posting these incredible pictures, it is not fair to my stomach 🙂 I love the stringy cheese! No need to wrap this. I’ll take it as is. This lasagna looks so good, Ingrid. Mmm, I can just taste the copious amounts of cheese and red gravy. Yum! 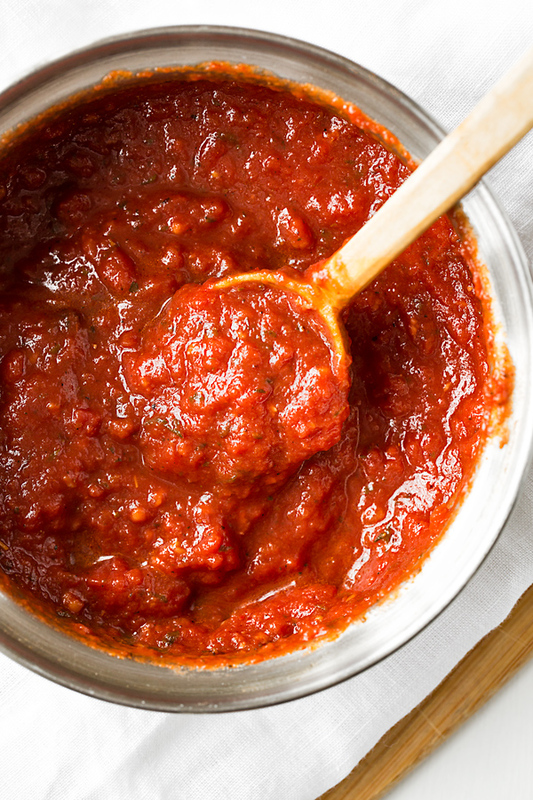 I’ve never made my own sauce before, but I’m certainly going to try it with this recipe! Will this sauce recipe only make enough for this “roll-ups” recipe, or will there be extra that can be frozen for later? Hi Beth! This recipe yields quite a good amount; depending on how “saucy” you like your pasta/lasagna, you’ll most likely have a touch left-over. But to tell you the truth, this sauce is so easy that you could quickly whip up another batch as you need it, fresh; it’s only about a 10 minute simmer process. Enjoy! I love the idea of lasagna but not always how time consuming it can be. 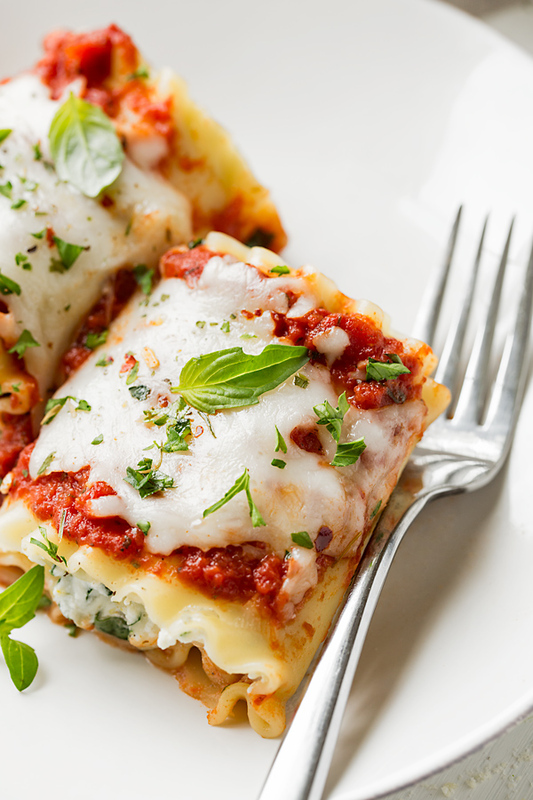 These nice little lasagna roll ups are the perfect solution to that! And they look magnificent.